April 1st & April 8th: Smitty & Miles, a new and used impro/sketch duo, has its first show at West of Lenin! 2. No one has ever seen me improvise. Those few who have, retain only a vague, air brushed approximation of the memory. Will ya come? Will ya? We are finding our voice as an improv duo of a certain age, and we could use a great audience for our adventure. Adventure: an unusual and exciting, typically hazardous, experience or activity. Get tickets now, cause West of Lenin only has 88 seats, and we both have large families in the area. I’ve been having a grand time teaching Improv for Writers in this soon to be razed former mortuary. SUMMER INTENSIVE at Freehold. This July, I’m teaching a 65-hour class. 9:00 – noon, Mon – Fri, for 4 weeks, ending in 2 performances. I have taught this class thousands of times, and doubt I’ll tire of it. The basic class is the best. 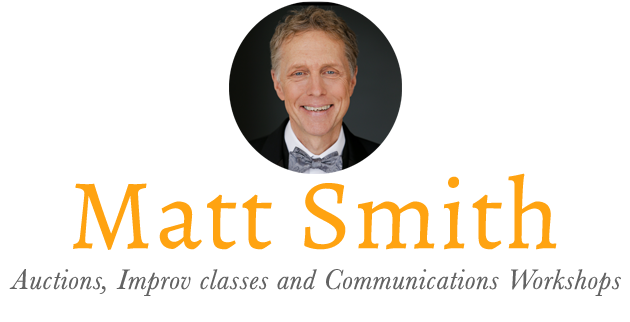 It introduces great concepts to which improvisers try to hold. And it’s always fun. I have 30-plus auctions booked for 2015, and this is the season, right now. It’s crazy busy and lots of fun. I’ll be all over Seattle, in Winthrop, and in Santa Fe. Things slow down in June. March 28th @ 7:00pm you can see it at Seed Arts Cinema Series,Homegrown Documentaries. I’m also taking Nuns to The Florida Film Festival in Orlando in April, as a film maker. What to wear….! We are still looking for a space in LA, Chicago and NYC to show the film. Know one? We have strong interest in distributors wanting to show the movie online, but are first wanting the film to play on the big screen. If we don’t find a taker, we may raise funds to “4-wall it” – which is to rent space, drive publicity and get our own audiences. Kinda like having a kid! Pattie Miles has been joining the “Improv for Organizations” workshops. That means better follow up, and another person who really “gets” it to work with clients, to make sure our messages are landing. Nordstrom is doing the most notable job ever of marking territory, and using improv principles to articulate and frame their culture. ← May 2014 – “Nuns” @ SIFF!